Once Mark and I put our heads together, though, our article quickly filled up with tips, procedures, hints, photos and ideas, and grew to cover seven pages of the May 2014 issue of Trailer Life!! Holy cow!! I had no idea we’d learned so much about this topic and that we had so many ideas to share with the RVing community. Motorhome Magazine liked the article so much they ran it in their July, 2014 issue! Dumping the holding tanks is easy. A few short steps and you’re done! Dumping is a subject that is near and dear to every RVer’s heart (smile). So here is a synopsis of what we think are the most important things to do when visiting an the RV dump station or when you have sewer hookups at an RV park. Over the years, we’ve received lots of queries about our thoughts on composting toilets and whether we use one or would recommend installing one if you are going to do a lot of boondocking. So there’s a section on that too. 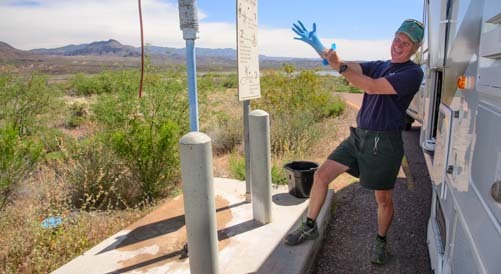 (1) The most important thing at the RV dump station is to protect yourself from any pathogens that may be lurking, and to leave the place clean for the next guy. Before starting, put on some rubber gloves. We use disposable nitrile gloves. 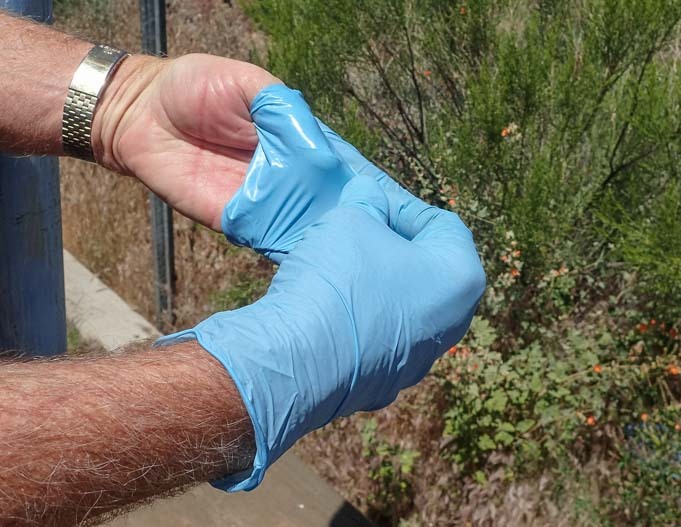 As you do your work at the dump station, be aware of what you touch, because even though you are wearing rubber gloves, your gloves will still spread bacteria from one item to another. At the end, when you take the first glove off, peel it back from the wrist to your fingertips so it turns inside out. Then peel the second glove off the same way while holding the fingertips so the second one rolls inside out into the first one in one unit. This keeps your hands from touching the exterior of the gloves. Then dispose of them properly. (2) We connect a clear plastic elbow to our sewer hose so we can see what is coming out of the tanks. It’s not the prettiest picture, but this way we know the status as we go through the dump process. (3) Before connecting our fresh water hose to the potable water spigot, we spray the nozzle of the water spigot with Clorox bleach spray. (4) At the RV park, keep the black and grey tank valves closed. This keeps the liquids in the black tank and prevents the solids from drying out and getting stuck to the bottom and sides of the tank. It also prevents odors from the sewer to creep up into the rig via the sink. (5) When flushing the black tank (about every 4-6 days or so at the RV park, or when at the RV dump), flush it first and flush the grey tank afterwards to clear the sewer pipes and hose of any black tank solids. (6) At the RV dump, after the black tank is completely empty, we use a five gallon bucket to pour a pail of water directly down the toilet into the holding tank below. This removes any solids that are stuck to the bottom of the tank under the toilet. Usually two buckets is all that’s necessary for the water to run clear, although occasionally we need to dump in a third bucket. If you have a window in your toilet room, you can run a hose through the window rather than lugging buckets of water around. (7) Once you are finished, hose down the whole area so the dump station is clean for the next RVer that comes along. (8) In general, be courteous to your RVing friends at the RV dump. We find that popular dump stations often have a line of RVs waiting, especially at the end of a weekend. Try not to dawdle. We’ve heard of people taking showers while at the dump station because there is unlimited water and sewer capacity, but lordy, I would not be happy if I rolled up to a dump station and had to wait around for someone ahead of me to finish their shower!! Many RV parks and campgrounds allow RVers to dump their tanks in a site for free, usually about 25% to 50% of the cost of staying for a full night. Many of these places are listed in the above links. Of course, most folks figure that if you’re going to pay $10 to dump the tanks, why not spend $30 and spend the night at the RV park or campground as well! Thin rubber gloves fit fairly tightly on your hands and they can’t easily be pulled off by the fingers the way ordinary gardening or cold weather gloves can. Also, to be totally sanitary about things, it is best not to touch the outside of the gloves with bare hands after the dirty deed at the dump station is done. Grab one glove by the edge of the cuff and peel it off your hand over your fingers stopping just before the glove is completely removed. Then peel the other glove off over the first. Now the first glove is sealed inside the second glove which has been turned inside out. When we first started RVing, we saw tons of folks at RV dump stations using their bare hands. 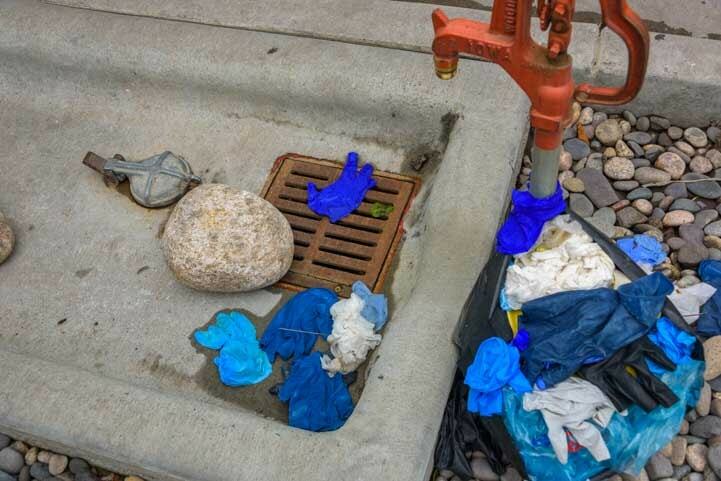 Fortunately, this article and others have encouraged people to protect themselves against lurking pathogens by using disposable rubber gloves. 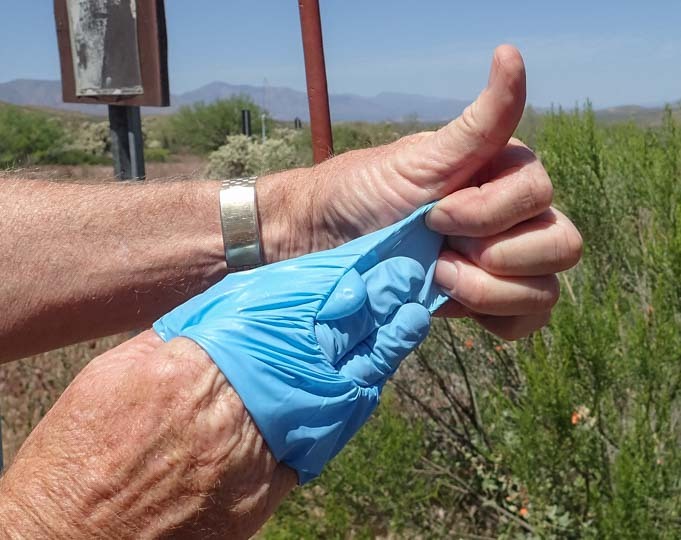 However, we’ve begun to notice used disposable gloves lying around dump stations on the ground, in the grate and in the nearby bushes because folks just drop them after taking them off instead of throwing them in an appropriate trash container. After removing the gloves, please dispose of them properly. There may be a trash can at the RV dump station. If there isn’t, please put them in your own trash rather than throwing them on the ground or in the grate of the dump station!! How inconsiderate and unnecessary! This was in an otherwise cute town in Montana! There are a ton of RV and boat holding tank treatment products on the market, and some of them are extremely damaging to the environment. Many are made with various forms of formaldehyde and other toxic chemicals. If you remember high school biology class and those gruesome dissections of fetal pigs, dogfish and other critters, you might remember that formaldehyde was the putrid smelling chemical that was used to preserve the carcasses. Formaldehyde isn’t the only toxic chemical used in RV holding tank treatment products. Some products are made with different types of embalming fluids. Getting ready to do the dirty deed. The idea behind using preservative and embalming chemicals on dead organic matter is to remove the stinky odor. But do you really want the contents of your holding tank to be preserved? It might be okay to preserve that stuff a long long time if it didn’t go anywhere, but what about the sewer system or septic tank that the holding tank’s contents are being transferred into when you dump them? We have come across RV dump stations that were closed due to poisoning of the septic field and damage to the ground water supply caused by toxic RV holding tank chemicals. The states of California and Arizona as well as the EPA have issued warnings about the use of those chemicals in RV holding tanks. California has considered banning their use all together. As responsible RVers, I think it is in all of our best interests if we use chemicals that won’t pollute our ground water supply. 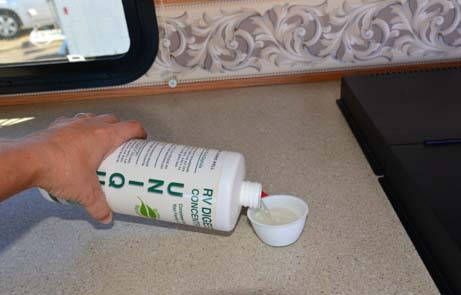 We have used a product called RV Digest-It by Unique Natural Products ever since we first saw it at the Quartzsite RV Show in 2007 in our first year of RVing full-time. The demo was pretty convincing. Two identical glass jars were filled with dog food, balled up toilet paper and water. One was beautifully preserved by a formaldehyde-based holding tank treatment product. The other was reduced to mush by RV Digest-It. RV Digest-It is an enzyme and bacteria based solution. The enzymes break down the solids in the tank, and the bacteria eat them up. What’s very cool is that, over time, the bacteria colonize in the holding tanks, and they continue working away, munching on the goodies in the tank and digesting them. They climb the walls and nibble on what’s there, keeping the walls of the tank clean and helping the tank level monitoring system perform better. 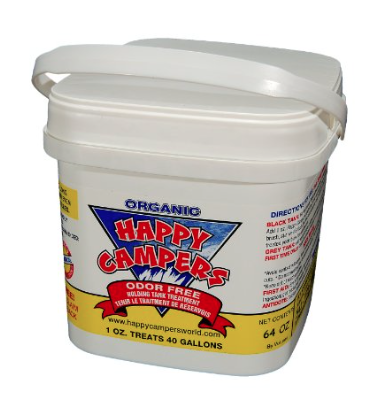 Another excellent environmentally friendly product that we use is Happy Campers Toilet Treatment. This is a powder product rather than a liquid. We have had equal success with both products. 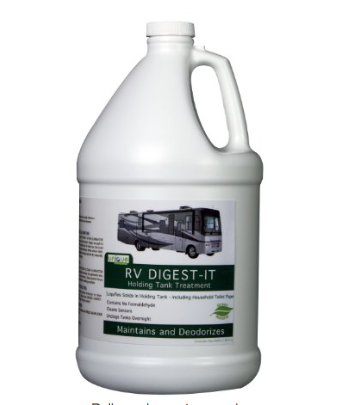 RV Digest-It and Happy Campers are not the only enzyme-bacteria based holding tank product on the market. They’re just the ones we’ve used in both our trailer and our boat. Click here for a list of other enzyme-bacteria based holding tank treatment products. These may be just as good, we just don’t have personal experience with them. Unfortunately, RV Digest-It and Happy Campers are not carried at many RV or boating supply stores, or Camping World, West Marine or Walmart. When we find one or the other, we stock up. Fortunately, they are available at Amazon. Almost all black tank clogs are due to wadded up toilet paper. Most enzyme-bacteria based holding tank products claim to be able to break down even the thickest toilet papers. If you aren’t sure whether you can trust that claim, one way to avoid toilet paper clogs is to buy special RV (or marine) toilet paper. We like the plush stuff, and we don’t want to test whether the bacteria like to dine on Quilted Northern, so we have opted, in our little household of two people, not to put our toilet paper down the toilet and into the holding tank. It sounds disgusting, I know. But it would be a lot more disgusting to have to fix a clogged black tank! In our trailer, we find we have an overabundance of plastic supermarket shopping bags. Rather than toss them out, we put our soiled TP in a bag, sometimes doubled up, and dispose of the bags daily. Every shopping bag gets used, and there is nothing smelly about it. Obviously, this is a very personal decision, and not one that’s worth debating if you don’t like the idea. However, I put it out there as something to consider. For us, having lived with holding tanks and funky RV and marine toilets for 7 years, it has worked just fine. When it comes to freeing an RV holding tank clog, many people swear by Happy Campers Extreme Cleaner. We haven’t used it because we haven’t had a clog that bad, but if your tank is clogged up, give it a try! Over time, the grey and black tank gate valves may begin to leak a little bit from debris getting caught and preventing the valves from closing completely. When this happens, you get a nasty little surprise at the RV dump when you first take the cap off the sewer line — a small bit black or grey water dribbles out. Having a bucket ready to catch that stuff is helpful, but it’s still messy. One easy way to deal with this is to install an inexpensive Valterra T-58 twist-on gate valve. This screws onto the sewer opening the same way the sewer hose does and provides a final opening and closing valve to catch the dribble. Screw on the twist-on valve and keep the valve closed until you are ready to dump the tanks. At the RV dump, start by removing the cap off the twist-on gate valve to attach the sewer hose, then open the gate valve to let the dribble out, and then open the grey or black tank valve to begin the dumping process. RV LIFESTYLE TIPS – Costs & Finances, Boondocking, Jobs & Work, RV Repairs, etc. IS A COMPOSTING TOILET A GOOD IDEA IN AN RV? There is a growing interest in using composting toilets in RVs and boats instead of conventionally plumbed flushable RV toilets and marine heads, and we have received lots of inquiries from people who want to live an off-the-grid boondocking lifestyle, like we do, asking us if they should install a compost toilet in their RV. We have been very happy using CONVENTIONALLY PLUMBED RV toilets and RV DUMP STATIONS. Composting toilets are flushless and more or less “odorless” systems that can compost human waste into dirt for planting flowers in a garden if the poop and pee are left in the toilet long enough. Unfortunately it takes SEVERAL MONTHS for a composting toilet to compost human waste into dirt. What do you do with it in the meantime? Composting toilets are fabulous in a cabin or a house with a compost pile out back. Simply empty the toilet into the compost pile and watch it magically transform into beautiful gardening dirt! Compost toilets are wonderful for part-time RVers who have a compost pit in the yard where they can dump the toilet and actually compost the poop into dirt. Composting toilets are also great for part-time RV and boating use if the owner uses the RV or boat for a few weeks and then puts it in storage for months at a time, allowing the feces in the toilet to compost completely during that time. Composting toilets are COMPLICATED for full-time RV use! WHERE you are going to DUMP YOUR POOP when the toilet gets FULL? A kitchen sized trash bag full of human poop is not something that is easy to dispose of LEGALLY, and most campers don’t want to camp in a place where someone has left a bag of it behind. If you have not done much boondocking yet, it may come as a shock that many dispersed campsites on public land are filled with trash, much of it extremely disgusting (used diapers, used condoms, used toilet paper, you name it). We routinely fill a grocery bag or two with trash when we set up camp on America’s public lands. We don’t want to be hauling out other campers’ poop too! Digging a hole big enough to bury a kitchen bag of poop properly (at least 6″ below the surface) will take a lot of work, especially in places like the western states where the ground can be as hard as cement. Also, poop from an RV composting toilet is TOO THICK to stuff down an RV dump station sewer pipe. and it puts the poop in the sewer or in a septic system where it belongs! Composting toilets are very expensive. Two of the more popular ones are manufactured by Nature’s Head and C-Head. When Do Composting Toilets Make Sense in an RV or Boat? The big question for anyone considering one of these toilets is: will your waste stay in the toilet long enough — that is, for enough months — that it can be composted into dirt as the system is designed to do? If not, what are you going to do with it? When Should I Empty It? Where Should I Empty It? The usefulness and convenience of these toilets as compared to traditional RV toilets and heads depends entirely on how you use your RV or boat. Do you put your boat or RV in storage for months at a time? Do you boondock in remote areas far from other people? Do you stay in campgrounds and RV parks? Can you easily take your boat three miles offshore in the ocean where it is legal to dump human waste overboard, or is your boat on an inland waterway? Do you know of a public composting bin or composting company located near your home, or do you keep a compost pile in your back yard? The answers to these questions are important, because you need to make a decision when the bins holding your urine and feces in the toilet get full. If you can put the material in a composting bin or compost pile in your yard, or if you store your RV or boat for six months or so at a time, the composting action can work as it is designed to do, either in the composting bin/pile or in the toilet. If you don’t have these options available, then you will be forced to deal with the uncomposted material, as the toilet fills, and find a place to put it. As you can see by the statements made by compost toilet manufacturer Nature’s Head above, composting toilets make sense for occasional RV and boat use, but they are not designed for people who live in and use their boats and RVs full-time. Composting toilets separate the urine and the feces to reduce the odor. To get some great dirt for planting, simply leave the feces waste in the toilet while the RV or boat is in storage, or put it in a public Composting Bin or in your own compost pile in your yard. Unfortunately, whether the feces has time to compost in the toilet or not, the urine waste that the toilet separates out needs to be disposed of every few days. 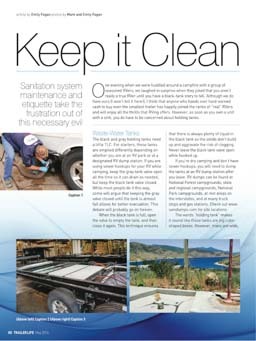 This frequent disposal of the urine may be the deciding factor against composting toilets for many RVers and boaters. Compost toilets are built with a removable container that you can carry to a public restroom (or elsewhere) to flush the urine down an ordinary toilet. (Note that by doing this you haven’t saved the planet’s water. Drinking water is still going down the toilet, just not down YOUR toilet!). The C-head composting toilet is designed so you can use commonly available one-gallon plastic water jugs to dispose of the urine. Finding an appropriate place to dispose of the urine every other day or so is something to think about. A gallon of urine poured out in the boondocks fouls the land much more intensely than a cup of pee on a bush. For boondockers staying in one place for several weeks, the walk to an appropriately remote spot that won’t foul the area for future campers at that site will get longer and longer, since you obviously don’t want to keep dumping these gallons of urine in the same place over and over. If you have a shovel, you can dig a hole and pour the jug-o-pee into the hole, covering it with at least 6″ of soil. You could also drive it to a public restroom to flush it down the toilet or pour it into a campground vault toilet. However, waltzing into Starbucks or Wal-mart carrying a jug-o-pee destined for their restroom could be a little awkward. In addition, unless the RV or boat is put in storage for six months at a time so the contents of the toilet can compost completely, the feces waste will also need to be disposed of before it is fully composted, likely after about two weeks to a month. At that point the material still resembles feces and it has a cookie dough-like texture and it is not odor free. The manufacturer recommendation is to dump the material in a composting bin, because there are legal ramifications with the disposal of biological waste. Boats that can get three miles out to sea can legally dump that waste overboard. For boats on inland waterways and for full-time RVers, finding a public composting bin will be very difficult (we’ve never seen one in our travels), so you will need to find an alternative way to dump the poop. On public land, that is, the National Forests and BLM land, the legal requirement for disposal of human waste is to dig a hole and bury the feces under at least 6 inches of soil. This is not too hard to accomplish in places where the ground is soft. However, it is very difficult in many of the western states where the ground is extremely hard and is often like cement. Using a pick-axe will help. One way to soften hard ground is to soak it with water or dig the hole after a rain storm. Of course, one of the primary reasons for using a composting toilet is to save water, so soaking the ground with your precious water supply makes little sense. Also, you can have a six month wait for rain in the western states. In most places the local laws allow for the dumping of adult diapers, kitty litter boxes, and individual baggies of dog poop (that owners pick up while walking their dogs) into conventional dumpsters. So, the common method for RVers is to bag the feces and put it in a dumpster. Simply remove the feces container from the toilet, put a kitchen garbage bag over it and dump the feces into the bag with a few good strong shakes. One manufacturer recommends sterilizing the feces with bleach before bagging and dumping. Of course, a big kitchen bag of smelly poop is not the nicest thing to put in a public dumpster, especially for the next person who raises the lid to dump their trash. What about the Grey Water Tank? For RVers, there is still the grey tank to contend with. 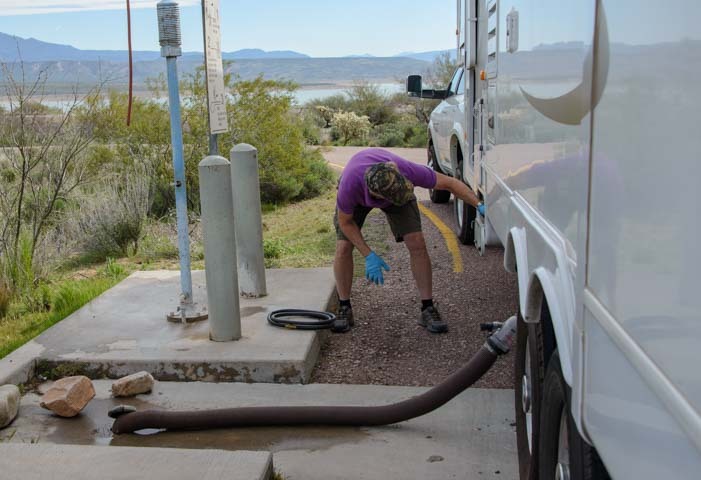 While boondocking in remote areas, it is common practice for RVers to discharge the grey water on a thirsty bush or patch of grass and then to refill the fresh water tanks from jerry jugs. However, in our experience of boondocking every day for all these years, there are many long periods of time when we are not in a place where we can do that. Depending on why you want to live in an RV full-time, it is likely that you will not be boondocking on public land in remote areas all the time (or even all that much). Traveling east of the Mississippi, there is extremely little public land available for boondocking. In those situations, if you have a composting toilet and the grey tank fills up, you will have to go to an RV dump station to dump the grey tank, which defeats one of the main purposes of having a composting toilet, which is to avoid going to RV dump stations. One advantage to replacing a conventional RV toilet with a composting toilet is that the former black tank can be sanitized and plumbed into the grey tank plumbing system, increasing the overall grey tank capacity. Of course, this involves more labor and expense. Our 78 gallons of grey water holding tanks has been totally sufficient for very comfortable off-the-grid RV living for many years. Do You Save A Lot of Fresh Water with a Composting Toilet? You will use less fresh water with a composting toilet than with a conventional flush toilet because no fresh water is wasted in flushing. However, in our experience, we don’t flush all that much fresh water down our conventional RV toilet in the first place. With our conventional gravity-fed, non-electric flush toilet, only about 10% of our total fresh water supply gets flushed down our toilet. This equates to about 7 gallons every ten days to two weeks (just over a jerry jug’s worth). About 60% of our fresh water is used for showers and 30% is used for washing dishes in the kitchen and for washing our hands and faces and brushing our teeth at the bathroom vanity (we drink bottled water). If our RV toilet were an electric head with a macerator, as is found in higher-end motorhomes, more fresh water would be used for flushing — perhaps 15% of the total fresh water capacity. So, although a composting toilet will save some fresh water, it won’t be saving enough to make a big difference. How Does a Composting Toilet Affect Resale Value of an RV or Boat? Another thing to consider is that a composting toilet in an RV or boat will most likely negatively impact its resale value. You probably aren’t thinking about selling your RV or boat right now, but the day will come when you hope to get a good price for it. However, because many people will not want to buy an RV or boat that has a composting toilet in it, you may find a lot fewer prospective buyers. You can hang onto the parts you remove when you install your composting toilet, so you can reinstall them at resale time, but where are you going to keep those parts in the meantime? Do you really want to go through that extra labor of installing a composting toilet and then removing it later? Should You Install a Composting Toilet in Your RV? To us, the high cost of purchasing a composting toilet, the expense and labor of retrofitting a composting toilet into the bathroom, and the mess and difficulty of dealing with the waste, all make the whole idea of a composting toilet seem totally inappropriate for RVing or boating on a full-time basis. In our minds, the only situation where a composting toilet makes sense is for people that use their RV or boat for a few weeks and then put it in storage for six months or more at a time, giving the toilet a chance to compost the human waste into dirt as it is designed to do. Alternatively, if you have a compost pile in your yard that you can empty the toilet into each time you return from an RV road trip, then a composting toilet in your RV or boat will be useful. For full-time RVers, a composting toilet doesn’t make any sense at all. In the end, since an RV composting toilet will likely require you to dispose of your non-composted human waste by burying it, flushing it down public toilets or putting it in public dumpsters, a much less expensive and much simpler but very similar alternative would be to get a little portable camping toilet. The huge advantage of a portable camping toilet over an RV composting toilet is that it is less than 1/10 of the cost!! Going to the RV dump station or marine pumpout station for a few minutes every two weeks just isn’t all that bad! However, all these doubts aside, there are RVers who use them and have blogged about their experience. Stef and James travel in a van on vacations, and they outfitted it with a composting toilet. They offer an honest look at what part-time RVing with a composting toilet is like here: The Straight Poop on our Composting Toilet. When I asked Roxi of the Good Luck Duck if she would buy another composting toilet, she said, “In a New York Minute!” Roxi lived with a composting toilet in her motorhome on a full-time basis while boondocking in remote areas for three years (she no longer lives in a motorhome). She was kind enough to answer my many questions about her experience for this post. 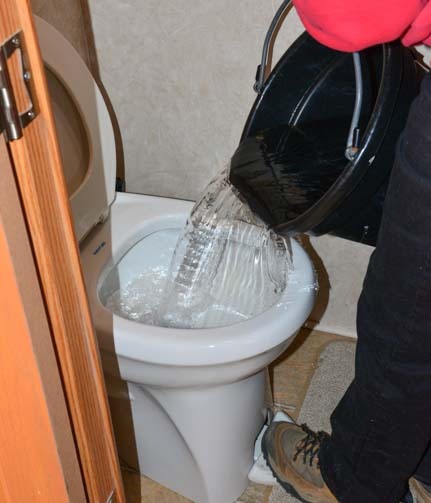 To get the real scoop on the poop from someone who has been there and done that with composting toilets, check out her blog post describing her composting toilet experience in her motorhome. Another pair of RVers who used a composting toilet in their RV full-time for a few years is Nikki and Jason of Gone With the Wynns who market and promote the Nature’s Head composting toilet. They describe the steps for emptying an RV composting toilet HERE. They don’t mention WHERE THEY PUT IT but do note that you need to know the local laws for dumping human waste wherever you are. After a few years of living in an RV they moved on to very exciting sailing adventures living aboard a Leopard catamaran. For us, we find that dumping our holding tanks at an RV dump station is effortless and painless. If you’re a gal and your significant other does the dirty deed at the RV dump station, here are a few ideas for how you can help out. If you ever experience a failure with your conventional RV toilet, here’s what’s involved in replacing it (an hour’s job). This entry was posted in The Full-time RVing & Cruising Lifestyles and tagged Boondocking, New, News, Non-Travel, Popular Articles, RV Dump and Plumbing, RV Tech Tips, RV Tech Tips Trailer by Roads Less Traveled. Bookmark the permalink.